Nestled in the heart of Noblesville, this modern community promises an elevated living experience thanks to its refined interiors and exclusive resident spaces. Inside your home, luxe finishes such as granite countertops, crown molding, and wood-style finishes await. Beyond your doorstep, you can indulge in on-site attractions, including a saltwater pool, a grilling cabana, and a 24-hour fitness center. Discover classical sophistication with a touch of modern style in these apartments at Prairie Lakes. 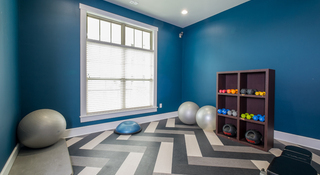 As you first step into your new home, you will find complimentary color schemes and elegant flooring options that create a warm and welcoming vibe. Continue into your sleek kitchen, which includes forty-two-inch cabinetry. Chic pendant lighting illuminates a charming breakfast bar, while built-in wine racks or wine refrigerators add another layer of luxury. The bedrooms include large closets and plush carpeting, while the bathrooms boast garden soaking tubs and granite vanities. Select apartments offer private garages, double vanities, and walk-in closets as well. Explore this community near Carmel and uncover an extensive selection of resident spaces designed to enhance your life. Whether you’re trying to get fit, feel relaxed or both, Prairie Lakes has you covered with a 24-hour fitness center with WellBeats self-guided programming, a multi-purpose studio and like a secluded sundeck with comfortable lounge furniture. With underwater benches, beach-design entry, cabanas, and pergolas, the pool area feels more like a high-end resort. Conveniences such as valet dry-cleaning, 24-hour electronic package pick-up, and a car-care center make everyday tasks seem easy. Prairie Lakes is a pet-friendly community with no weight limits for cats or dogs. We welcome most breeds of dogs. However, because certain dogs do not thrive in a community environment, we cannot accommodate the following breeds, dogs resembling these breeds, or mixes of these breeds: Akita, American Staffordshire terrier, bull terrier, chow, Doberman, German shepherd, pit bull, Canary mastiff, Rottweiler or wolf hybrids. Exotic or farm animals are not allowed in the apartments. Pet Policy: The community has no weight limits and is happy to have most breeds of dogs. However, because certain dogs do not thrive in a community environment, we cannot accommodate the following breeds, dogs resembling these breeds or mixes of these breeds: Akita; American Staffordshire Terrier; Bull Terrier; Chow; Doberman; German Shepherd; Pit Bull; Canary Mastiff; Rottweiler and wolf hybrid. Exotic or farm animals are not allowed in the apartments. Parking Comment: Off street parking, detached and attached garages, available.